Built for the frac sand industry, Superior’s TeleStacker also has applications in ship loading and perhaps leach pad stacking. 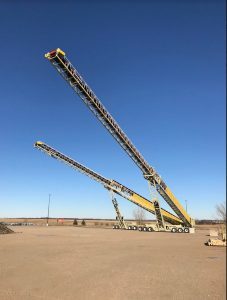 a U.S.-based manufacturer and global supplier of bulk material processing and handling systems, has manufactured the first ever 64-metre road portable, telescoping radial stacking conveyor. This TeleStacker conveyor, designed and built for a frac sand operation in Texas, is the longest one of its kind ever built. The conveyor has a stockpiling capacity of 363,000 tonnes, 30% more than any other telescoping conveyor on the market. According to Superior, the company’s solution is less than half the cost of a fixed or stationary tripper conveyor with the same capacity. In addition to high capacity frac sand applications, operations that may benefit from a longer unit include sites that need to build inventory with large tonnage stockpiles and shipload applications. The 64-metre TeleStacker conveyor will fill a vessel hold more completely than shorter models. To find your nearest Superior distributor, go to http://superior-ind.com/distribution-search/.